I took a walk yesterday afternoon in search of the early spring blooms and blossoming trees. It’s been a long and endless winter here in the northeast and I’m desperate for spring. I’m a gardner as well as a photographer so I love both growing capturing the many different shapes and colors of the plants I come across - from blush colored peonies to the curves of a dahlia, to the implied intimacy of barely touching tulips. Groupings of similar prints tell a story. They also help to fill a large expanse of space such as a long hallway or entryway. For narrower walls, you can place them above each other 2x2. This is a nice way to organize sets of smaller prints like 8x10s or 5x7s. Floral prints are a sophisticated way to decorate a nursery. Keep the frames and mats simple and the art can be reused once the child outgrows the nursery. Keeping your tones monochromatic is a striking way to define a modern yet feminine home. A spray of pink spring blooms or white baby’s breath keeps the look simple but beautiful. 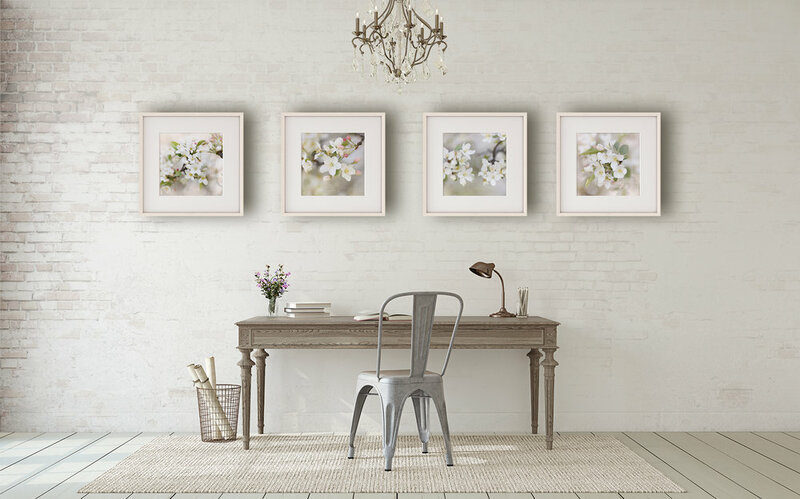 If you want to go a little more upscale, choose a silver or gold frame. Size and color matter - a rich, dark oversized print will fill your wall and draw your eye towards the center of the room. Pair it with a black gallery frame and the image will really stand out. For a space like this, a 24x30 or 30x40 print size is the way to go. Any smaller and the print will get lost on the wall. An elegant still life can add a touch of elegance to your home. Make sure to coordinate the colors in the image with the ones in your room. Too many colors can overwhelm the eye.Check out the art of old Dutch masters Ambrosius Bosschaert and Rachel Ruysch for even more inspiration. Ultimately the most important tip is to make sure you choose work that you love. Not every image you choose will always be in style but as long as you love what you are hanging, you will never tire of it.